What if Batman Is Evil and The Joker is the Hero? Batman has never been the goody-two-shoes Captain America or Superman type (there&apos;s plenty of blood on his hands), but nevertheless it&apos;s pretty clear where things stand in Gotham City: Batman, a.k.a. Bruce Wayne, is the hero who maintains order and justice, and his nemesis, The Joker, carries out evil plots and goes out of his way to mess things up. At least, that&apos;s how things are supposed to work. But a new fan theory posted on Reddit by user generalzee flips that narrative on its head. According to Mashable, generalzee&apos;s theory suggests that The Joker is the one striving to make Gotham a better place, and Batman keeps getting in the way. 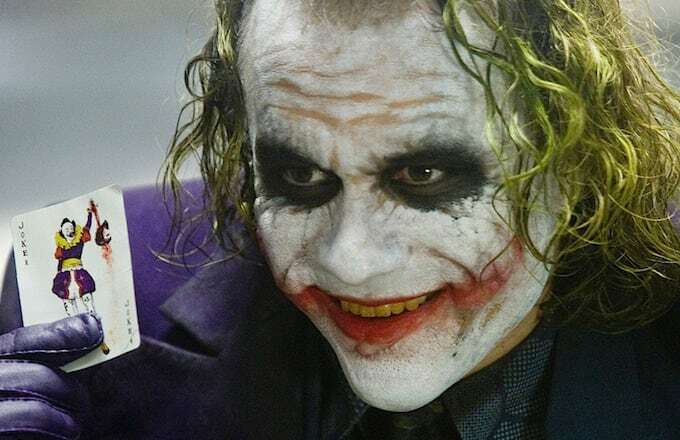 Generalzee&apos;s theory centers around The Joker&apos;s actions in The Dark Knight. He begins by setting the stage: Gotham is a corrupt city full of twisted officials and run by the mob. Over the course of the film it&apos;s The Joker, and not Batman, who fixes things. To summarize, the bank robbery in the beginning of the film was designed to force crime lord Lau out of hiding. Once Lau is out in the open, The Joker can systematically eliminate top criminals in Gotham by tracking his movements, which he does. The Joker even admires Lieutenant James Gordon — Joker&apos;s famous applause scene during Gordon&apos;s promotion is sincere, not sarcastic. "I actually think that Joker believed in Gordon, one of the few officers on the force who was truly incorruptible," generalzee writes. In the film, when Joker kidnaps Harvey and Rachel Dawes. Ultimately, Batman fails to save Rachel and Harvey is left horribly scarred in a building explosion. "[Joker] knows what Rachel&apos;s death would do to Harvey psychologically, and that Batman would eventually have no choice but to kill Harvey. This breaks Batman psychologically, and also makes him a villain, a true villain, the kind that abandons his own principles," said generalzee. The defeat drives Batman into hiding for eight years, which is where The Dark Knight Rises picks up. Coincidentally, Gotham was fine during Batman&apos;s absence — it&apos;s only when Bane shows up that things get out of hand. So aside from the whole kidnapping thing, The Joker actually seems like a pretty decent guy. Maybe we&apos;ve misjudged him all along.